Saw mill experimental control for log sawing machine using Allen Bradley PLC and Inductive Proximity Sensor Controls in a large lumber mill. Manufacturing System Simulation using PLC Control. PLC controls in manufacturing simulation. Problem: Machine operators want to prevent the out-feed rider roll from slamming down onto the machine, once the log has passed. The rider rolls, both on the in-feed and out-feed sections, hold the log down firmly on the feed rolls, while it goes through the saw blades. 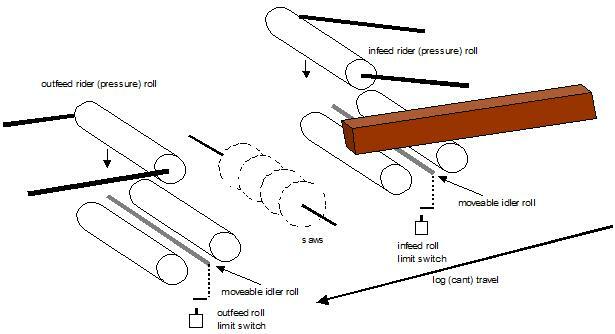 Possible Solution to Consider: Raise the out-feed rider roll just before the end of the log goes out from under it. BUT not too soon. Below is the diagram of the log traveling through the gang of saw blades. The in-feed rider roll is actuated by a limit switch, when the log enters the machine. Once the trailing end of the log passes off of the moveable idler roll (and limit switch) on the in-feed section, the in-feed pressure (rider) roll is raised by the limit switch. The log dimensions vary greatly. The critical piece of information is knowing how fast the log travels through the saw. Knowing when the trailing end of the log CAME OFF the in-feed limit switch is the best means of planning for early lifting of the out-feed pressure (rider) roll. 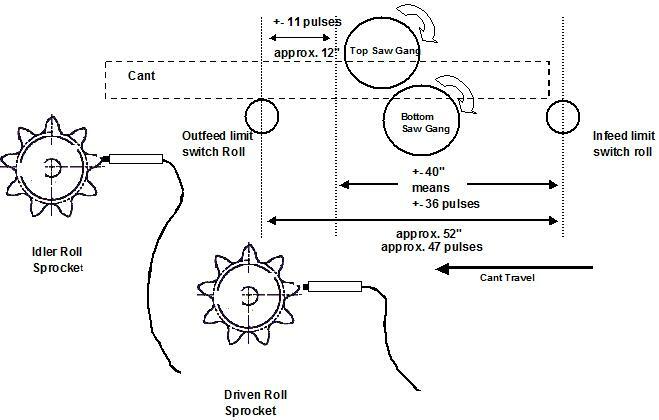 Using the existing machine sprocket teeth that drove the in-feed and out-feed bottom rolls, an inductive proximity sensor could be used to generate a fixed pulse rate, that could be counted. The Two Problems with this Approach: The inductive proximity sensor doesn't turn on instantly, when the target is in front of it. The PICO control does not instantly register the signal sent to it from the proximity sensor. The geometry of the sprocket compounds the problem above. This project was as much about product development research for a controls manufacturer as it was improving the machine performance. Even when the rpm, tooth geometry and tooth count of the sprocket were known, the manufacturer of the PLC and proximity sensor, could not say for sure, if the PLC would correctly count the pulses, or even if the sensor would detect every tooth going by the sensor. Burhans Research worked with the customer to determine the actual speeds of the machine and the product traveling through it. Then, Burhans Research fabricated an experimental control system to interface with the existing limit switches and relay logic of the machine. This temporary installation was safe, and allowed the machine maintenance and operation personnel to observe how the new scheme would operate the machine and how sensitive it would be to adjustments. Burhans Research does manufacturing system simulation research.